Ironbridge  is an important historic location in Shropshire, England. Ironbridge Gorge is a UNESCO World Heritage site. It is one of the "birthplaces of industry" and central to the story of the industrial revolution in Great Britain. 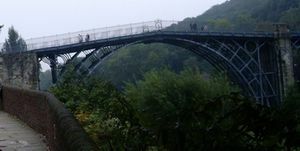 Ironbridge Gorge is on the River Severn, 5 miles (8km) south of Telford in Shropshire. Take junction 4 from the M54, and follow the brown and white traffic signs. Telford Central rail station (08457 484950) is 5 miles (8km) north of Blists Hill Victorian Town. The National Cycle Route follows the route of a former canal and railway, now called "The Silkin Way" from North Telford, through the town centre to Ironbridge, via Blists Hill Museum. A regular shuttle bus service(01952 200005) operates throughout the Gorge every Saturday, Sunday and Bank Holiday Monday. This bus also has limited links to the Rail Station. If you are visiting the museums and want to see the surrounding area, a car is essential as public transport links vary from limited to non-existent. Note, however, that there is no free parking in Ironbridge itself, though parking charges are normally reasonable. The worlds first Iron Bridge - there is a small visitors centre on one side. Blists Hill Museum - a living guide to the Industrial Revolution which started in this town. Engineuity- an interactive science & engineering museum aimed at children. The Greenwood Trust - a forest management and conversation centre to the west of Ironbridge. Buildwas Abbey - An ancient abbey ruin owned by English Heritage just outside Ironbridge. It is advisable to use a car to get to as, while it is within walking distance, it is a walk of around a mile along a road with no pavement. A passport is available which allows entry to all the museums, which has traditionally been very good value for money if you intend to visit a number of them. Various expensive pubs and nondescript curry houses / Italian restaurants. Also a good Thai place next to the bridge. There is a Youth Hostel at Coalport and Coalbrookdale, both campuses being part of the same hostel. The latter campus is very modern and popular, though is not ideal for self catering visitors. No camp sites are available in Ironbridge itself, though there are more in South Shropshire and Shrewsbury directions. The Valley Hotel, a period Best Western property to the west of Ironbridge, with pleasant views overlooking the park and a particularly well regarded restaurant. South toward Much Wenlock and Church Stretton part of the Shropshire Hills Area of Outstanding Natural Beauty. It's worth exploring Wellington which, like Ironbridge, is part of the new-town of Telford, which has a nice town park which is worth a visit if you have children. Telford Steam Railaway is also a pleasant trip on a Sundays or Bank Holidays, as is a walk up the nearby Wrekin Hill. This page was last edited on 30 July 2015, at 08:03.